There’s no doubt that targeting three target markets, each with a different language, is a challenge in itself. But there are also other audiences coming to the island, and they may well rely on a basic grasp of either Spanish, English or German to understand the offer. 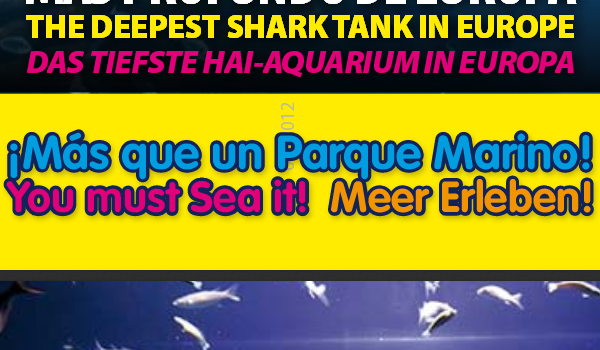 The Spanish is straightforward: ‘¡Más que un Parque Marino!’ (‘More than a marine park!’) There’s no play on words (although I’m not sure why ‘parque marino’ has been given capitals), so it’s easy to grasp, and it suggests there’s more to see than you’d expect. The English is, I think, weaker: ‘You must Sea it!’ Firstly, the capital letter is not needed. Secondly, the word play is weak; ‘see’ to ‘sea’ is not very imaginative and could be lost on non-native speakers. Finally, there’s no hint of why you have to ‘sea’ it, unlike the Spanish line. The German also has a go: ‘Meer Erleben!’ (‘Experience the sea!’) I believe this is a play on ‘Meer’ (sea) and ‘mehr’ (more), as in ‘Experience more!’. I’m not a fluent speaker, so I don’t know if the word play rings nicely to a native. This strapline is also stronger than the English one. I don’t think the straplines all need to mean the same thing, because they should be adapted for each target audience (and they’re used throughout the company’s marketing materials as stand-alone straplines). But I do think the English version is the weakest of all three and that word play should be considered very carefully in a multilingual setting. What do you think? Do you like the straplines or do you think there’s room for improvement? Do you think it’s best to keep things simple, rather than trying to be too clever in this instance? Or do you think the word play is so subtle that nobody even notices that ‘see’ has been swapped for ‘sea’?